Way to go, Billy Buck! The late, great Chicago Tribune columnist Mike Royko once wrote, “sports fans are the biggest assholes in America”, and unfortunately, he has all too often been proved correct. Sports figures themselves are also more than capable of sophomoric behavior. So it was nice to see an example of real class on the part of both fans and player yesterday at Fenway Park, as long vilified first baseman returned to Fenway Park for Opening Day. If you’re a Red Sox fan, the memory of Game 6 of the 1986 World Series is seared in your soul like a brand, a brand that’s shaped like an “L” for “Loser”. The Red Sox on were on the brink of winning their first World Series title in 68 years. And then, like the cursed team they were, the Sox just let it slip away. Calvin Schiraldi had entered the bottom of the 10th inning with a two-run lead. After retiring the first two batters, it was announced by the sportscaster (prematurely, as it turned out) that Bruce Hurst had been named as the series MVP. But Schiraldi allowed three straight singles to Gary Carter, Kevin Mitchell and Ray Knight and was replaced by Bob Stanley. Stanley, who himself has had a love-hate relationship with Sox fans over the years, proceeded to throw a wild pitch, which allowed Mitchell to score the tying run. Then Mookie Wilson, whose name is almost as hated in Boston as Bucky Dent’s, followed by hitting a ground ball that rolled between Buckner’s legs, scoring Ray Knight and giving the Mets a victory that left Sox fans believing in the Curse of the Bambino like never before. When the Red Sox lost game seven the following night, it just all seemed so inevitable, so very, very fated. And Buckner got all the blame, of course. The film of the ball rolling through his legs has been played thousands upon thousands of times. The poor decisions of feckless manager John McNamara and the erratic pitching of Schiraldi are noted by knowledgeable baseball fans. But it was Buckner’s error that became the stuff of nightmarish legend for the eternally tortured Red Sox fans. The memory of that game has been become so distorted over the years that there are some Sox fans who actually believe that Buckner’s error came in game 7 and thereby cost the Sox the World Series. And so it was gratifying and heartwarming to see Buckner return to Fenway Park to a standing ovation. Not since May of 1999, when the Fenway Faithful gave a standing ovation to Joe Torre upon his return to the game after missing time due to prostate cancer, have I been so proud to be a Sox fan. Buckner was a fine player whose career has been unfairly tarnished by one play. It was high time that Red Sox fans showed some respect to one of the players who got them to the World Series in the first place. And speaking of Mike Royko, this ill-fated game also had the effect of perpetuating the myth of the “Ex-Cubs Factor”. Created by freelance journalist Ron Berler but popularized by Royko, the theory stated that any team headed into the World Series with three or more former Cubs (a team every bit as accursed as the Red Sox) on its roster had “a critical mass of Cubness”, and was doomed to failure. From 1946 until 2001, this theory held true with the sole exception being the 1960 Pittsburgh Pirates. 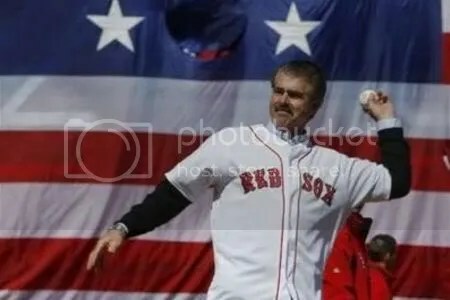 Care to take a guess which team Bill Buckner played on before he came to the Red Sox? You got it: the Cubbies. And if that’s not weird enough, it has been discovered that Buckner was actually wearing a Chicago Cubs batting glove under his first baseman’s mitt when he made that error that forever etched his name in Red Sox infamy. The final irony? Calvin Schiraldi, an extremely talented young pitcher who had been a teammate of Roger Clemens at the University of Texas and had helped pitch them to a College World Series victory, had been traded to the Red Sox that very year from the New York Mets. He was never the same after the 1986 World Series. After spending one more year with the Sox he was traded to–guess who–the Chicago Cubs. Congratulations to Bill Buckner. It’s good to see him back.